Stories based on paranormal concepts are difficult to believe, and more difficult to write. 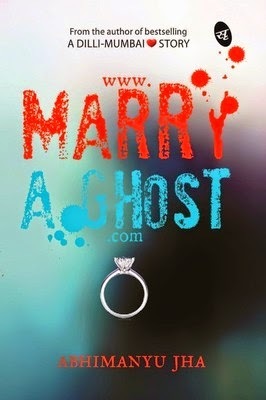 I haven’t changed my opinion about this genre after being done with this book ‘www.MARRYAGHOST.com’ by Abhimanyu Jha today, I am as perturbed as ever about them. Apart from the honest appreciation for the author’s attempt for going out of the way and making ghosts seem as normal as possible there is not much of a positive impression that I have had. I wouldn’t regret giving spoilers in this review firstly, and then the “to be continued…” in the last page only left me dumbfounded. What could have been a beautiful thriller turned out to be a dud with its average choice of words and events. Two friends Veeru and Jerry open a website for ghosts, and the one who relatively believes less in them, Veeru ends up encountering one, the way the transition in his belief is presented by the author seemed quite obtuse. The discussions between them in the first few pages of the book especially about females when they are opening the website only made me shudder, such rotten talk! When people stand for and talk about Indian authors in the literary scene I would definitely want to hide or burn these pages! And then enters a ghost who does not know who she is, for the time being named ’Maahi’, she wants to finds her unknown estranged lover and then an Indian Institute of Science Professor, Dr. Burman who is equally strange arrives to help her! Veeru and Maahi travel to Goa then to Pondicherry in search of her ‘Hrithik’ a golden haired man, so named after the most handsome Bollywood heartthrob around town because she does not remember him either. Veeru does these things out of no obligation and when he starts seeing his invisible companion he falls in love with her in the process. He even goes to the extent of calling her ‘Miss Dark Chocolaty’ because she remembers she loved dark chocolates! That was something hilarious to read, a girl ghost who neither remembers her name nor the person whom she wants to search does remember that she loved dark chocolates and that there is a Bollywood hero by name Hrithik! Someone pinch me please! Veeru has eight days to save her, and to help her get into her oblivion. Also there is one Marquis, a five-hundred-year-old Portuguese ghost making mysterious appearances. Ghosts going through emotions- crying, laughing, giggling, talking naughty and feeling an intense pain is something too impetuously presented in the whole story. Not every reader is Veeru or Jerry fortunately. What was the battle and danger about??? I would be glad if anyone enlightened me about what I just read! PS: This review is a part of the biggest Book Review Program for Indian Bloggers. Participate now to get free books!